A meme making a bogus claim about the U.S. giving gold to Afghanistan is circulating online. More than two years after leaving office, former President Barack Obama is still a popular subject of misinformation online. However, the meme isn’t labeled as satire, so once it is shared online there’s no way to know it was made up. The picture used in the meme, showing pallets full of gold bars, is from the Bank of England, which opened an exhibition in 2015 called “Discover Gold” that shared some of the contents of its vault to visitors at the Bank of England Museum. It has nothing to do with the U.S. or Afghanistan. Also, there is no “Trump audit of Obama” and there have been no reports of the U.S. transferring gold to Afghanistan. That claim, though, is reminiscent of Trump’s criticism during the 2016 campaign of a $400 million payment that the Obama administration made as part of a legal settlement to reimburse Iran for the purchase of U.S. military equipment in the late 1970s that it never received. The claim that the U.S. transferred gold to Afghanistan, however, is unfounded. America Loves Donald Trump. Facebook page. 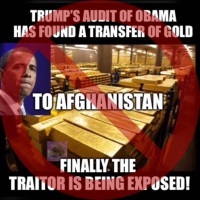 “Trump’s audit of Obama has found a transfer of gold to Afghanistan finally the traitor is being exposed!” 15 Dec 2018. Misinformation Directory. FactCheck.org. 6 Jul 2017. “Exhibition Review : Discover Gold at the Bank of England Museum from 19th January 2015.” LondonVisitors.wordpress.com. 19 Jan 2015. Kiely, Eugene, et al. “FactChecking the First Debate.” FactCheck.org. 27 Sep 2016. Tully, Shawn. “5 Things You Need to Know About the $400 Million America Sent to Iran.” Fortune.com. 5 Aug 2016. "Trump's audit of Obama has found a transfer of gold to Afghanistan."